A freshman member of New York’s State Assembly has introduced a bill that would make using physical force against a police officer a hate crime, similar to the law just enacted in Louisiana. 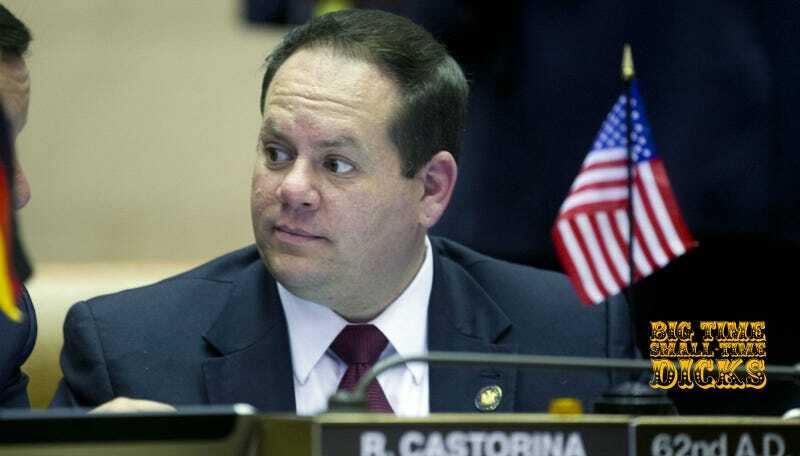 The New York bill’s sponsor, Assemblyman Ron Castorina of Staten Island, blamed Black Lives Matter protesters for inciting violence against police officers. Castorina has previously referred to abortion as “African-American genocide,” tweets frequently about Benghazi, and voiced concerns about socialists taking over the Democratic party. He seems fun! Hate crime laws have historically only applied to people who are attacked due to their race, gender, national origin or sexual orientation, but these bills indicate that conservative lawmakers around the country aim to make police officers into a similarly protected class. In an interview with the New York Observer, Donald Trump’s son-in-law’s newspaper of record, Castorina said the bill was necessary because of Black Lives Matter. Castorina started work in April; barely a month later, he caused an enormous ruckus when he referred to abortion as “African American genocide,” during a debate over whether the protections of Roe v. Wade should be written into New York state laws. He continued by claiming that millions of African-Americans have been “murdered” since Roe was decided. Several Democrats immediately rose to debate Castorina, but he refused. Numerous Democrats then followed suit, resulting in a bizarre scene in which deliberations were on hold for several minutes as Castorina was asked, one by one, if he would yield to each of them and declined each time. Besides his busy schedule alienating his new coworkers, Castorina also has time to tweet about a rich variety of right-wing conspiracy theories. He was particularly energized during last week’s Democratic National Convention in Philadelphia. He is, you will be shocked to learn, a fan of Donald Trump. Even the Observer — which, again, has a cozy and familial relationship with Trump — notes that New York state law already has very harsh penalties for attacks on police officers and other public servants like firefighters.